Nobody knows who Miss Rose Sweetly is, and she prefers it that way. She’s a shy, mathematically-minded shopkeeper’s daughter who dreams of the stars. Women like her only ever come to attention through scandal. She’ll take obscurity, thank you very much. All of England knows who Stephen Shaughnessy is. He’s an infamous advice columnist and a known rake. When he moves into the house next door to Rose, she discovers that he’s also wickedly funny, devilishly flirtatious, and heart-stoppingly handsome. But when he takes an interest in her mathematical work, she realizes that Mr. Shaughnessy isn’t just a scandal waiting to happen. He’s waiting to happen to her…and if she’s not careful, she’ll give in to certain ruination. Rose loves math, astronomy, and she is just so smart. But she is a woman, she is not white, she is a shop keeper's daughter, but she is lucky and does the math for a professor. She does what she loves. Stephen is a rake, he writes for a newspaper, and he falls madly and deeply in love with a woman he meets on the street. But like I said, he has a bad rep, but I just loved how he wanted to get to know her. Not bed her. To know her. This was my first Milan book that I read. So sweet! 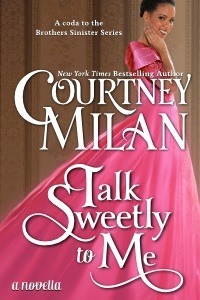 I need to pick up a book by Courtney Milan one of these days. I love that the heroine is not white and she's smart. The guy sounds like a great fellow too. Courtney Milan never disappoints for me! I've never read one of her books but this isn't my usual genre. Ooo, glad you enjoyed this one! It sounds fab, especially because it's an HEA! I purchased one of her books a few years ago, but never got to it. The Duchess War is still sitting on the bottom of my shelf. I need to try something by Milan. I wonder if my lib has novellas. I haven't read any of hers yet, but I've heard all the best things. A math geek hooking up with a rake, now that is unexpected. Going to have to grab this! I <3 diverse reads! The author sounds so familiar, I might have actually read one of her books way back during my romance phase! I read it earlier this year, wish it was a full-length book instead of a novella. Oh well. Ah sounds perfect. What I've read by CM I've enjoyed. Pity not longer. Sounds cute. And Rose sound great. *waves* :D I'm so lazy commenting this week. I've always wanted to try one of her stories. The cover is weird... is it historical? is it not? Share book reviews and ratings with Blodeuedd, and even join a book club on Goodreads.